Francis First Charger is the proud father of two children. Francis and his wife, Judy First Charger, have been together since 1977. They also have three grandchildren and many traditional children and spiritual children, of which there are too many to list. Judy serves as Administrative Assistant for their own consultancy business. Francis First Charger was born and raised on the Kainai First Nation (Blood Indian Reserve). He was raised in the traditional, cultural and spiritual ways of the Blackfoot people. He has six diplomas in agriculture and several letters of recognition and a certificate in management and financial accounting. He has been a Chief Electoral Officer (CEO) for three tribal elections including this 2016 election, the Blood Tribe Health Board Election for 2014 and 2017, as well as for the 2005 Kainai Board of Education elections. Mr. First Charger has managed his own advisory and consultant services since 1994. He has been employed in some major projects in the past, including his role as the General Manager of the Blood Tribe Agricultural Project (BTAP), a $66.5 million project. He was involved in construction, implementation, recruitment, and operational phases with BTAP. He was one of the people instrumental in coordinating the Japanese export of Timothy Hay, which was eventually an annual $6.5 million industry. He held the position of General Manager of Alberta Indian Agricultural Development Corporation (AIADC) when he was only 32 years-old: an unprecedented feat being the youngest General Manager of that company at the time. Also, he has done international work for the Kainai/Blood Tribe, in the U.S. for a special agricultural project and in Guatemala through educational work for Red Crow Community College (RCCC). 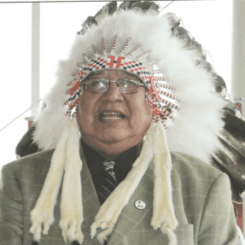 Recently, Francis First Charger Ninnaisipistoo “Owl Chief” (Agricultural Technology, ‘82) received the top award of Distinguished Alumnus from Lethbridge College on April 19, 2013. Francis was also the recipient of the 2010 Lifetime Achievement Award presented by the Aboriginal Council of Lethbridge. The Lifetime Achievement Award recognizes the many achievements of the urban population. He successfully coordinated the “First Nations’ Land Use Certificate Program” with 12 graduates from the RCCC program (June 26, 2004). “This certificate was entitled first of its kind by a National Edge Magazine. Eleven of the graduates were immediately placed within the industry.” These are only a few of the many accomplishments First Charger holds. He is an accomplished traveller, having seen the world from many different angles. His corporate and cultural travels have brought him to Japan, three times via BTAP business, and to such places as Italy to speak as a guest lecturer. Mr. First Charger has served on many committees in the past 20 years, including serving on the Aboriginal Council of Lethbridge as a corporate/spiritual advisor; a Treaty 7 representative on the First Nation’s Forestry Program, and on a steering committee for an economic impact study for the Kainai First Nation /Blood Tribe. He was the Special Advisor to the former Lethbridge College President, Tracy Edwards. Presently, Mr. First Charger serves on several committees: SHIA Housing Committee for the City of Lethbridge since 2004; Lethbridge SHIA Leaders Council; the Cultural Advancement Working Group for the University of Lethbridge, as well as Opokaa’sin on their Elder Committee and Opokaa’sin Board of Director. He also works for the Faculty of Management at the U of L under its Elders’ program since September, 2008. Owl Chief now provides advisory services to various organization, entities and/or institutions on Blackfoot Cultural Sensitivity Workshops and in working with other First Nations (Blackfoot People) and/or off-reserve corporations in the areas of international relations, culture, academic course development, agriculture, irrigation, project development, project implementation, and advisory to academic faculty and students through being a Cultural Counsellor and handling public relations for various causes.